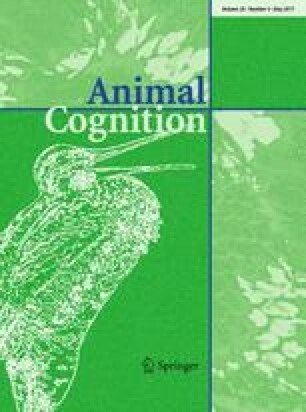 Susceptibility to geometrical visual illusions has been tested in a number of non-human animal species, providing important information about how these species perceive their environment. Considering their active role in human lives, visual illusion susceptibility was tested in domestic dogs (Canis familiaris). Using a two-choice simultaneous discrimination paradigm, eight dogs were trained to indicate which of two presented circles appeared largest. These circles were then embedded in three different illusory displays; a classical display of the Ebbinghaus–Titchener illusion; an illusory contour version of the Ebbinghaus–Titchener illusion; and the classical display of the Delboeuf illusion. Significant results were observed in both the classical and illusory contour versions of the Ebbinghaus–Titchener illusion, but not the Delboeuf illusion. However, this susceptibility was reversed from what is typically seen in humans and most mammals. Dogs consistently indicated that the target circle typically appearing larger in humans appeared smaller to them, and that the target circle typically appearing smaller in humans, appeared larger to them. We speculate that these results are best explained by assimilation theory rather than other visual cognitive theories explaining susceptibility to this illusion in humans. In this context, we argue that our findings appear to reflect higher-order conceptual processing in dogs that cannot be explained by accounts restricted to low-level mechanisms of early visual processing. The online version of this article (doi: 10.1007/s10071-016-1067-1) contains supplementary material, which is available to authorized users. We are grateful to Joyce Wuister and Diana Rayment for their help during the data collection process and Eva Worden for her help during the training process. We also thank two anonymous reviewers for their comprehensive and insightful reviews, as well as Maria Elena Miletto Petrazzini, Angelo Bisazza, and Christian Agrillo, for sharing the results of Miletto Petrazzini et al. (2016) prior to publication. This research was carried out with the support of La Trobe University Postgraduate Research Scholarships and La Trobe University Full Fee Research Scholarships. All applicable international, national, and/or institutional guidelines for the care and use of animals were followed. All procedures performed in the following experiments were in accordance with the ethical standards of La Trobe University Animal Ethics Committee (Approval Number: AEC15-18).